I am a native West Virginian and have lived in Huntington West Virginia most of my life. I graduated with a Bachelor of Arts degree in 1999 from Marshall University. I have two daughters and four grandchildren. I served honorably in the United States Army during the Vietnam Conflict. My interest in photography began in 1971 when I was serving in the military. 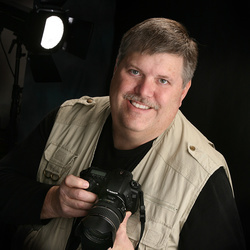 I am a past five term president of the Ohio Valley Camera Club and past Vice President of the Tri-State Arts Association. I am also a member of the Allied Artist of West Virginia and a member of the Orlando Camera Club. I currently work as a full time photographer, artist and instructor. I take on a multitude of commissioned projects as well as having ongoing classes and workshop at my classroom in Huntington West Virginia. My passion for photography has always been as an art form. I strive to convey a message or emotion though the use of a camera as my brush and the paper as my canvas. A few years ago my passion for art was broadened by my discovery of the joy in creating graphite portraits. The process took me by surprise as to how intimate the drawing process can be. And to my amazement and joy I found a hidden talent that I had always wished that I had. But as well as photography and graphite art has brought me such joy and pride, nothing can compare now with what I get out of teaching. For the past five years I have trained hundreds of new photographers and artist through my classes - workshops.